Silent Way is essential if you love analogue as much as you do digital, offering superb DAW integration for hardware synths. Control hardware analogue synths! MIDI learn is onboard and dead easy. Control your synth with an OSC device. Sample-accurate MIDI via ES-4/ESX-8GT. 64-bit support. No longer requires DC-coupled interface. Silent Way (version 1 of which scored 4.5/5) makes use of any DC-coupled audio interface to send voltage, gate and trigger signals to analogue synths. "Silent Way 2 can knock just about any vintage synth's pitch into calibration, assuming said instrument has CV and gate or trigger inputs"
Better still, it can knock just about any vintage synth's pitch into calibration, assuming said instrument has CV and gate or trigger inputs. Upon first using it, we were truly astonished to experience our collection of retro classics snap to attention, including the notoriously cantankerous VCS3. 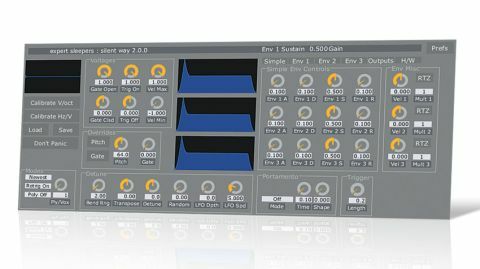 A suite of 18 VST/AU plug-ins, Silent Way recently reached version 2. Loads of new goodies have been added, not least of which is support for 64-bit systems, MIDI learn and plug-ins for use with Expert Sleepers' own hardware modules, the ES-4 and ES-5. "Calibration is simple: just route a raw, unfiltered oscillator to the plug-in, click Calibration and let it do its thing"
The main focus is the Voice Controller, from which you can calibrate and control your CV-capable analogue synth or synth module. That goes for both V/Octave and Hz/Volt instruments. Calibration is simple: just route a raw, unfiltered oscillator to the plug-in, click Calibration and let it do its thing. Once set up, you can save the calibration setting for recall in case your synth's oscillators drift. The Voice Controller provides envelope generators, glide and other useful tools that can be used in lieu of those in your synthesiser. There's also a dedicated LFO plug-in that does exactly what you'd expect, as does the Step LFO, which enables sequences to be sent to your synth CV input of choice. It's a very cool way to beef up a small modular. "Of the various new modules in version 2, we were particularly excited about the Learner plug-in"
Of the various new modules in version 2, we were particularly excited about the Learner plug-in. When opened, this automatically links to any other opened Silent Way plug-ins, the controls of which can be instantly assigned to respond to MIDI CCs. The Learner is equally adept with OSC and works in tandem with, say, TouchOSC on your iPhone or iPad to provide remote bi-directional control over Silent Way's functions and, subsequently, your analogue gear. It's pure genius. If you're counted among those fortunate enough to own a Madrona Soundplane, Silent Way has a plug-in that, used in tandem with the Learner, offers Soundplane control over any parameter of your analogue synth that can receive a CV input. Nice. "It takes a lot to blow our minds, but Expert Sleepers has done it again"
The remainder of the Silent Way plug-ins roster includes a Trigger generator, CV-to-MIDI and CV-to-OSC, for controlling MIDI and OSC devices from voltage outputs. There's also a quantiser for locking wayward or continuous voltages to scale, and CV Input, which makes for an easy means of recording incoming voltages. We shouldn't neglect to mention the simplest one of all, either: Silent Way DC, which offers a constant CV output that can be routed to a synth input. Oh, and finally there's the Follower, which tracks incoming audio pitch and spits out the appropriate voltages.